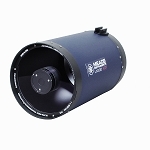 Meade's LX200-ACF Telescope brings to market a sophisticated catadioptric optical design favored by research facilities worldwide. 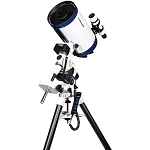 Most professional applications are either this style of telescope or gargantuan apochromatic refractors. 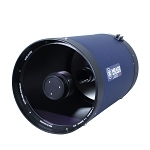 Meade's 14" LX200-ACF with UHTC multicoatings is a serious deep space instrument, with more than 3x the light gathering of common 8" catadioptrics. In order to truly take advantage of its outrageous capacity, it requires either the blessing of night skies unpolluted by artificial light or a pair of dedicated observers willing to move this large and heavy scope to where such darkness exists. 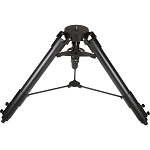 Although this premium 14" catadioptric scope's robust twin-fork altazimuth mount's meant for delightful observing first and foremost, it is easily adapted to extended astrophotography by using either Meade's Deep Sky Imager (which eliminates field rotation via software), Field De-Rotator, or #07008 Equatorial Wedge. 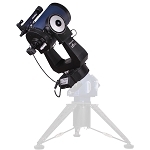 Power is supplied by 8 "C" batteries, but via optional accessories you can also adapt to an AC wall unit or a vehicle's cigarette lighter (which can operate in the field off of a Celestron Power Tank). 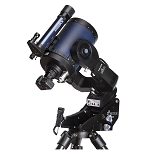 The LX200 features a Sony® GPS receiver sensor, which automatically inputs ultra-exact time, date & location values to help quickly align the telescope with remarkable (~1 arc minute) precision. 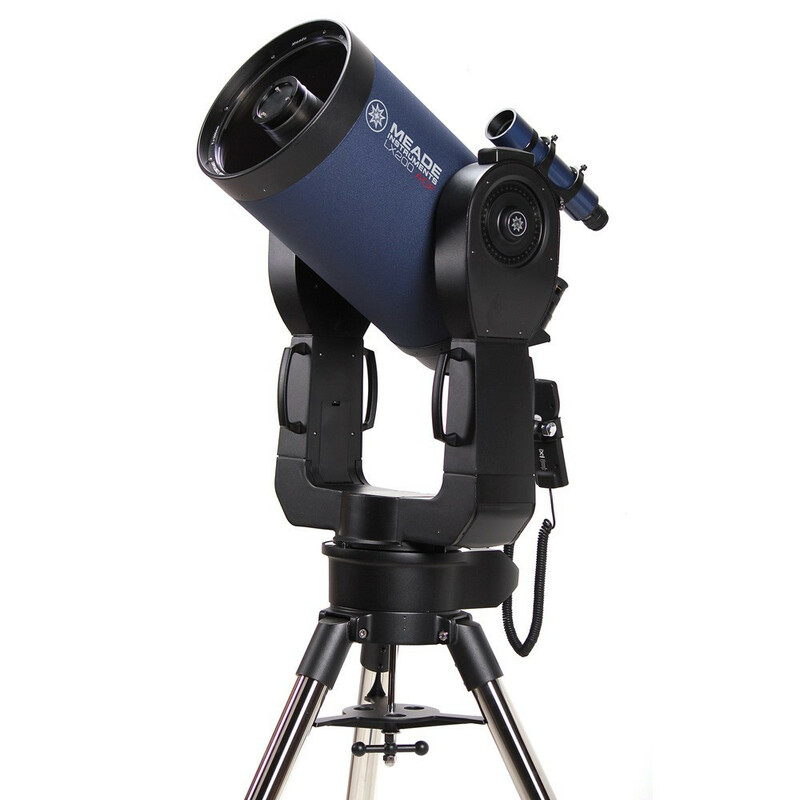 By constantly refining the pointing accuracy each time an object is centered and updated, Meade's Smart Mount™ & Smart Drive™ technologies provide permanent periodic error corrections (PPEC) on both axes by learning and averaging errors over the course of one or more training periods, to minimize guiding corrections during long-exposure astrophotography. Use 8 "C" batteries right out of the box, or instead adapt to AC power with the #07584 AC Adapter or to a vehicle's cigarette lighter port (or a Celestron Power Tank's port) with the #07043 DC Power Cord with Cigarette Lighter Adapter. Box Dimensions (LxWxH) 52.5 x 32.5 x 23.5"